Why are sofas so hard to get right? It’s weird thing that sofas are so hard to get right, but they really are. Furniture is generally easier to select than say redesigning a bathroom or commissioning joinery but over the years I have heard many sorry stories of profound disappointment on receipt of an eagerly awaited sofa. With this in mind, I often find myself using the 3am worry slot to agonise over an impending sofa delivery. However much I know that we have done exhaustive investigation, double-checking and confirming on behalf of, and involving, our clients in the run up to placing a sofa order, it is always a few hours prior to delivery that I decide that we have definitely overlooked something. There are a lot of things to consider before buying (or commissioning, more on this later) a sofa. Firstly, you need to think about what style of sofa is going to work in your room – do you lean towards a contemporary or traditional feel, mid-century modern or shabby chic? You don’t need to put a name to the style you want but if you are unsure of what look you prefer then you are not ready to enter a sofa shop yet. Fabric choice is important too and hard to consider in isolation. 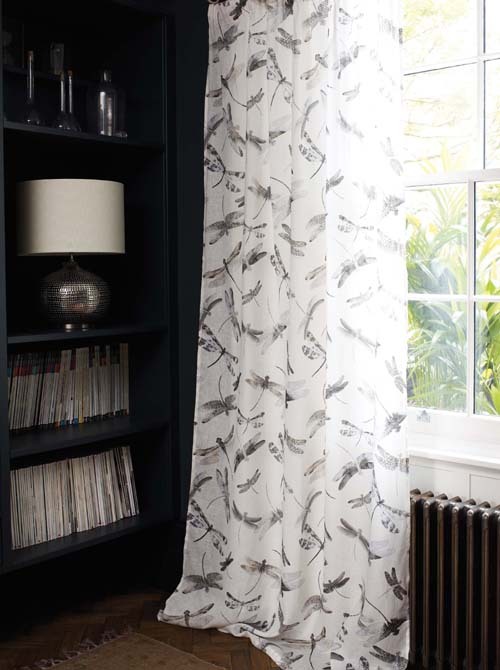 Building up a picture of the final scheme including wall colour, flooring, other items of furniture, curtains or blinds and so on will help you to avoid a fabric choice that you find hard to match to or that is a bland disappointment. There is a raft of other decisions to also be considered and these crucially include size – a measure of the room with consideration to other items of furniture is vital – and comfort levels of which height of back, depth of seat, filling and how the sofa is constructed all play a role. There are lots more decisions that are important but I won’t go into all of these for fear that you may decide that your hand-me-down, battered sofa that you hated when you started reading is perfectly all right. However, I will say that it is better to consider a lot of these decisions prior to spending that nightmare Saturday morning trailing around high street furniture shops and ending up feeling overwhelmed by information, underwhelmed with what you have seen and temporarily less keen on the loved one that you left the house with that morning. Once you have done your homework deciding which sofa is perfect for you, there is the possibility that you won’t be able to find what you want on the high street. Retailers are undoubtedly getting better at offering flexibility on size, fillings, legs, fabric and so on but I do find that we often have to commission a completely bespoke sofa in order to get what we want and this route is available to everyone. A good sofa maker is able to make or commission a frame to an agreed size, shape and style and then upholster it to your requirements which means that the world is your oyster. It also means that you are speaking directly to the expert, the person who is going to actually make it, so you should receive excellent advice. I know that you will be thinking that this all sounds very expensive and although it is not a bargain basement option, I always think it is less expensive than one would imagine, which is a reflection of not paying for a middle man and normally not paying for a swanky showroom and a glossy brochure. Although there are many excellent sofa makers all over the country, for historical reasons many are located in and around Nottingham which is where our ace upholsterer is based. There isn’t a chance that I will reveal his name but if you find a workshop with stressed looking craftsmen looking at an order and muttering ‘what on earth are they asking for now’, you may be in the right place. I’ve mentioned checking the size of the room but the other key measurement is the size of the doorway/staircase/sharp turn from corridor to room etc. A beautiful new sofa that won’t go into the room is not a pretty sight and if you think your proposed sofa won’t fit you may be able to have it delivered in pieces (removable legs or arms etc.) but you need to check that carefully. Don’t rule out the idea of an antique sofa that may or may not (if you are really lucky) need recovering. Often the frames (and sometimes the fillings) are well made and antique sofas can offer something a bit different. As an example, there is a company called Pelikan in Haverhill that buy original mid-century sofas from Denmark and restore and recover them. If your style leans in this direction, and you are in the market for a sofa, you should visit them immediately. Sofabeds are much better now than they used to be when neither the sofa nor the bed were all that comfortable. They are a good option if you are short of guest sleeping space but remember to consider how the room will function when it is transformed into a bedroom – do you have to move furniture in order to unfold the bed, where does bedding live, where do guests put their things? – often sofabeds are not used as beds because the room doesn’t really work as a bedroom, so it may be better to concentrate on sofa comfort rather than incorporating the bed facility. 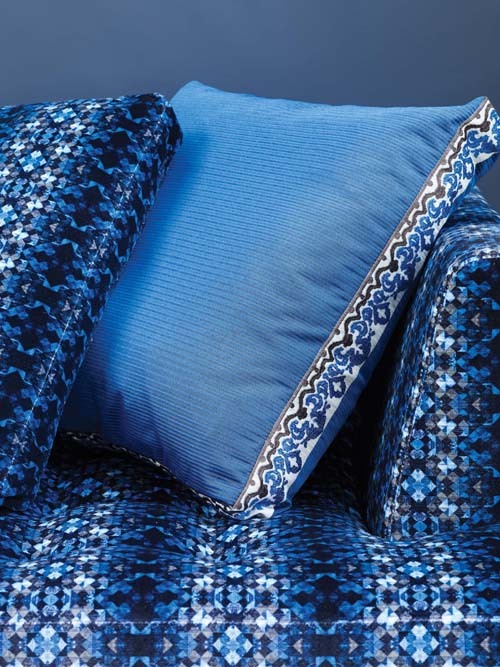 I hate hard and fast rules from interior designers because there is normally an exception but I am going to stick my neck out on scatter cushions made from the same fabric as the sofa. I genuinely can’t think of a situation where they are a good idea. The purpose of a scatter cushion (not back cushions or any cushion that is part of the sofa) is primarily decorative and small square cushions that blend into the sofa are apologetic at best. Lastly sales. Panic buying leads to mistakes. It is great to get a bargain but it is not a money saver if you immediately want to change it. There are many sales throughout the year and I guarantee that if you miss a sale bargain, there will be another tasty offer available sooner than you think. Finally to anyone who has made a mistake with a sofa purchase, and my heart goes out to you if you have, don’t add to the problem by matching to the mistake. I have had customers say to me that they have a sofa they hate but for whatever reason it has to stay so we need to build a scheme round it. This is not a good plan. My approach would be to design a scheme that we love without considering the offending sofa, and implement it, which will hopefully dilute the impact of the mistake. We may add a few accessories that tie it into the scheme and then we wait for the day the right sofa can be put into the room and the sofa mistake can be found a new home somewhere that it is welcome. 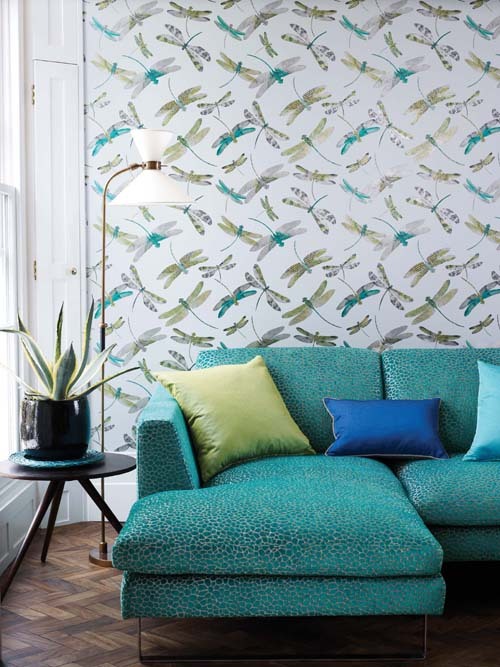 Here’s a little something lighthearted for the weekend – I have just visited House of Hackney‘s lovely website and seen their wonderful new wallpapers which made me smile. Aren’t they gorgeous? I think if you went to someone’s house and they had walls decorated in these designs, you would just know you were going to have a good time. And to add to the overall feeling of well-being, House of Hackney are giving 5% of proceeds of sales to the Born Free Foundation. Come on then, who’s tempted? I saw two new, brilliant and very different fabric and wallpaper collections on Friday afternoon and the contrast between them highlighted their strengths beautifully. I know that some of you will love one and not the other which is what makes our work so interesting and keeps us hunting for individual expression at home – so, I’d genuinely love to know, which do you prefer? 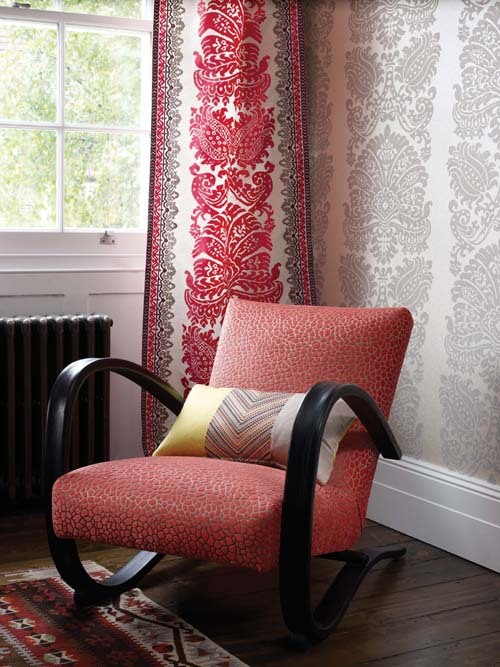 The first is the Purity collection from Harlequin. I was properly impressed with this collection and I think it will be tremendously useful in our design schemes. 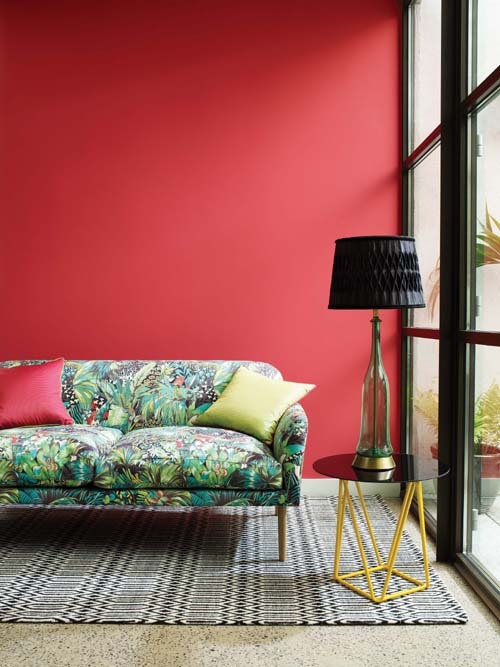 It is elegant and understated in a very confident way and uses small amounts of colour in clever ways. For the price, you get a lot of class for your money. 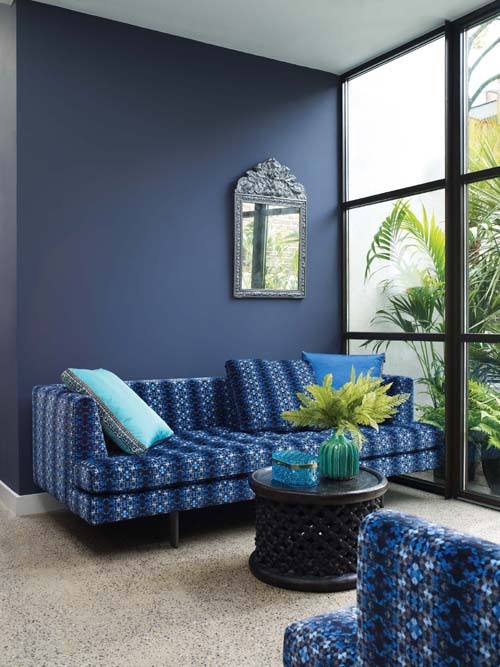 The second is from Scion (which is under the same mother brand as Harlequin) and is the Levande collection which has created a decidedly different look. It is fun, there is a retro reference but it is up to date and it is different. I was really taken with this collection and I think it represents great value for money. So Purity or Levande? What’s your cup of tea? I just spotted this delicious cottage in Canterbury on the very fabulous The Modern House which looks to me to be beautifully designed with lots of attention to detail on the interiors front. I haven’t seen it myself (it could be dangerous if I do) but if you have been inside, please let me know if it as lovely as the pictures suggest. More images and information at The Modern House. 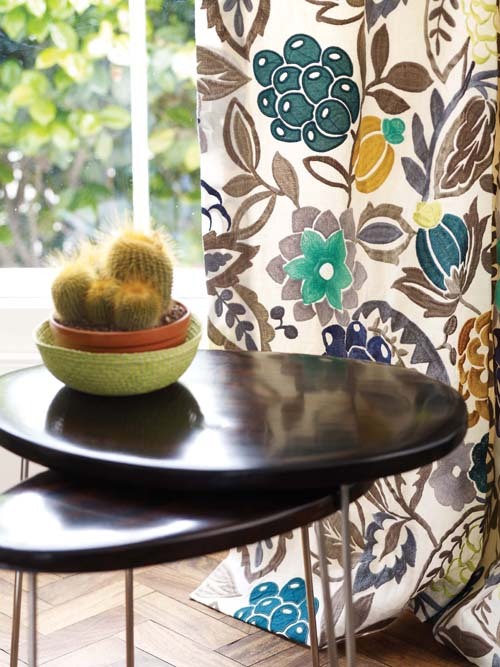 Our summer term classes are on Interior Designing your own Home and are starting on May 5th. Held at our office in Emmanuel Road, they will cover how to find your own style, how to get the best layout for your home, lighting, using colour, how to pull your schemes together and finally how to manage your project to get the best results. If you are updating your home there will be vital information about how to achieve the results you want , and hopefully some fun in the process. Get more information on our website www.angelandblume.com. It was always going to be a challenge for Matthew Williamson to create a second collection that is as fabulous as his debut collection for Osborne and Little (see blog post 17 September 2013) but he has only gone and done it. We saw the Samana Collection today and we were honestly blown away by it. It is a collection of wonderfully creative, truly different, gloriously colourful, beautifully detailed fabrics and wallpapers. Do you sense that we liked it? It’s easy to feel a bit nervous about using wallpaper with all the pattern, colour and occasional bit of texture that it brings, but I think that wallpaper is a wonderful decorating tool and following a few key principles will help to achieve just the look that you are after. As with any scheme, it is important to find your own style and stick to it, and this very definitely applies to your wallpaper selection. 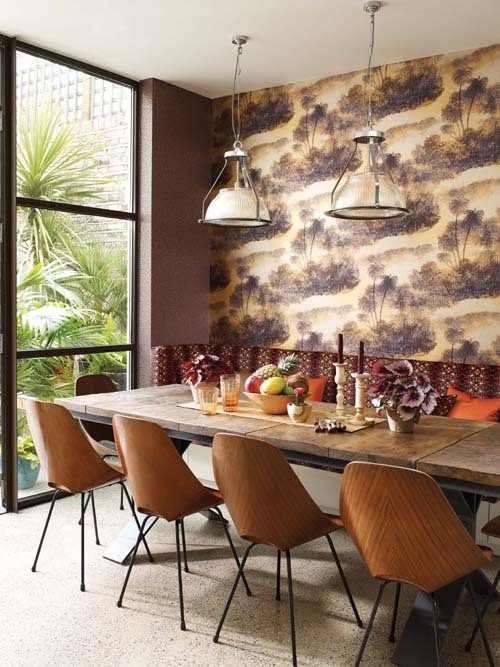 From traditional to modern, and all the styles in between, there is a wallpaper for you, so keep looking until you find a design that works for you. If you are using a wallpaper, don’t be afraid to hang your pictures – the pattern will still provide a good backdrop to your artwork. This classic country trellis pattern wallpaper creates a lovely background to the pictures – and the impromptu cocktail bar! Look at the paint colours for your ceiling and woodwork carefully as generally you want them to blend with the colour tones in the wallpaper. 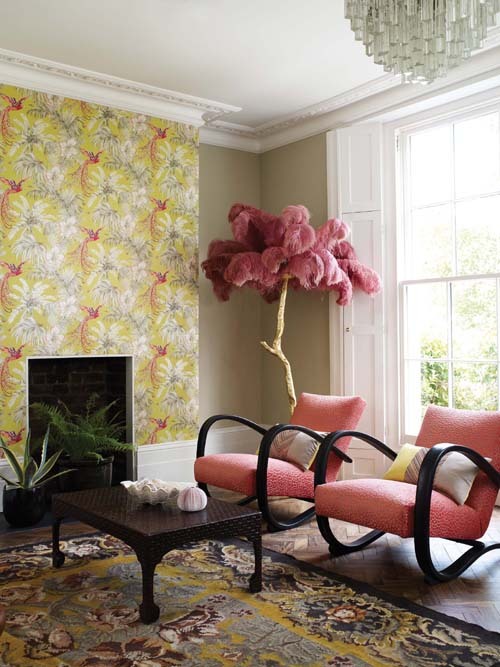 If your ceilings are low or sloping, think about wallpapering them – be brave, it will look great! I generally think that if your wallpaper is patterned (rather than a textured plain paper) that a plain curtain works better. 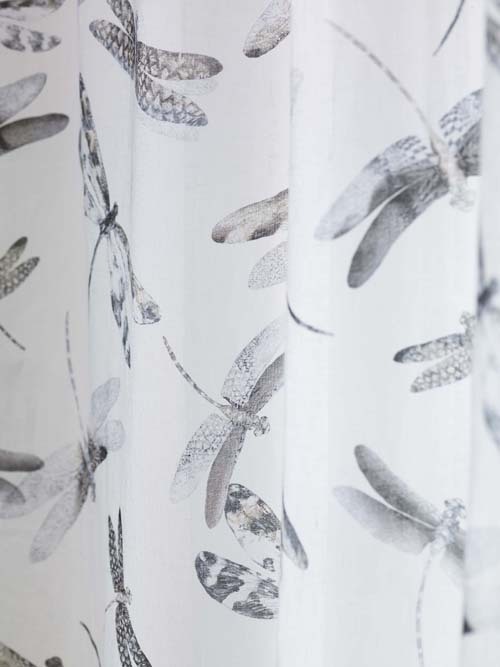 However, there is the odd occasion that using a matching curtain and wallpaper can look stunning. Wallpaper is a great way to add personality and fun to your children’s rooms and there are some great new patterns on the market for you (and your little princes and princesses) to choose from.